As time turns, cycles run. Seasons change while the sun rises and the moon descends, while the cold bites and the warmth comforts. In Tyria, the Elder Dragons rise, consume and slumber. Early Elder Dragon concept art. History cannot tell the number of times they have risen, nor does it say their origins. All that history can say is they awaken in cycles to consume the world, shaping it in their twisted image until all that was to consume is gone… Then, they sleep. 11,000 years before the Exodus of the Gods they rose, the earliest documented record of them rising, being passed down through legends by the elder races. They ended a cycle of life on Tyria, devouring and shaping the world, destroying land and life alike, and ending the lives of the Great Giants. The humans and their god’s have yet to arrive on Tyria, but much like the current battle against the Elder Dragons, 5 ancient races waged a war of their own against the impossible: the jotun, the mursaat, the Forgotten, the Seer and the dwarves. From what is known of this battle, the Elder Dragons were insatiable, and little to no life could flourish on Tyria as they consumed the world. The Elder Dragons are known to also consume magic. Magic was wild in Tyria, the elder races utilized it with freedom from the current consequences we find to this day. Magic was limitless before the human gods came to Tyria, and the elder races were legendary with their spell craft. The jotun were strong in magic and they were the guardians of the races, the Seers were adepts in magical containment and defence, and the mursaat were the greatest spell casters of all with their phasing spells and unparalleled attacks against the Elder Dragons and their minions. The races worked together to combat the Elder Dragons, however there was soon betrayal. The mursaat, presumably thinking themselves a superior race than all others wanted to see the extinction of lesser races. Using their phasing magic, they fled from the Elder Dragons and betrayed the other races to their demise. This was possibly the flame that ignited the war between the Seer and the mursaat. When the war reached it’s final toll and all was thought to be lost, the Forgotten cast a powerful spell on Glaust, the dragon champion of the Elder Dragon Kralkatorik, ultimately freeing her from his grasp. With her free will, she aided the elder races by bringing them into hiding, preventing their extinction. In an effort to contain pure magic, uncorrupted from the Elder Dragons, the Seers created the original Bloodstone to store untainted magic. And with Glaust, now redeemed as Glint, the races waited patiently as the Elder Dragons continued to ravage the world. The races emerged from their hiding broken. The Seers would see to another tedious war against the mursaat. The jotun, would be destined to losing their magic, causing civil war and the demise of their great empire. The dwarves would recuperate and reforge one of the greatest empires seen of all races on Tyria. The Forgotten will soon be tasked with overseeing the races the young races of Tyria with the arrival of the human gods. A jotun, later on in the story after their civilisation has fallen. And as for Glint… she will become one of the greatest allies to humanity and make a prophecy that will change the world of Tyria: The Flameseeker Prophecy. 10,000 BE Last of the Giganticus Lupicus the Great Giants, disappear from the Tyrian continent. 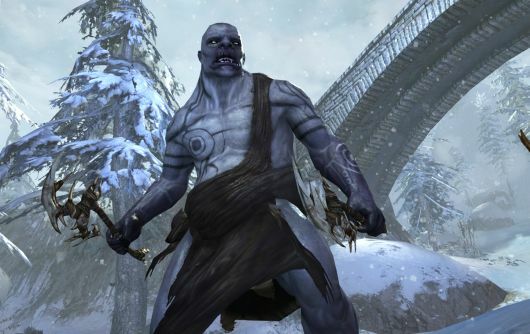 In the official timeline released by ArenaNet, 10, 000 years before the Exodus of the Gods existed the Giganticus Lupicus, otherwise known as the “True Giants” or “Great Giants” from the scholars on Tyria. Little is known of these great beings who existed before the gods came to Tyria. It is speculated that they were wiped out during the prior rising of the Elder Dragons. Their giant bones can be found across the world of Tyria, in the continents of Tyria and Elona. In Guild Wars 2, while fighting in Arah you encounter a risen soldier of the Elder Dragon Zhaitan who is a reanimated Giganticus Lupicus. This was the only sighting of these beings in more than 10, 000 years, and the means in which Zhaitan procured this corpse is a mystery. 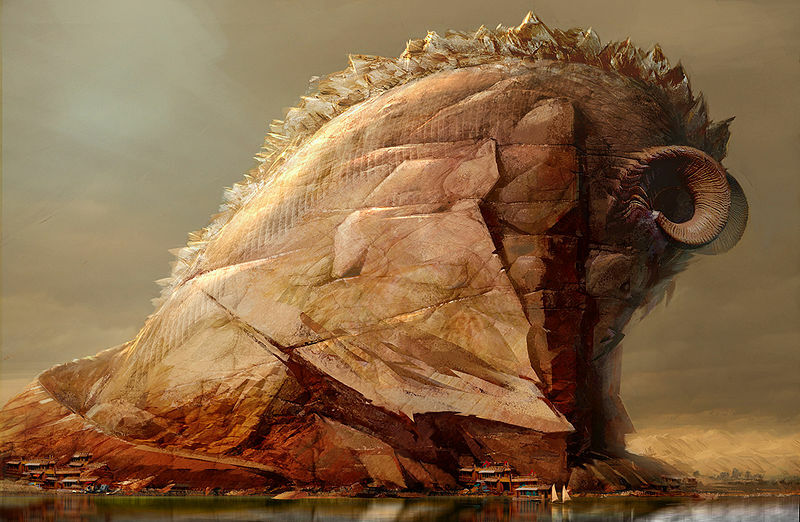 Concept Art for the Risen Giganticus Lupicus by Kekai Kotaki. From this reanimated creature we are able to see that he holds lupinus features, his face sharing traits you would find in the face of a jackal. This works with their name Lupicus, which is a rough latin reference for “of relating to wolves”. He is a much smaller giant compared to his ancestors remains which can be found across the Crystal Desert, leaving speculation that he may be an infant of his race, a defect, or maybe even a scaled version, having evolved 10,000 years later. This all depends however on how exactly Zhaitan was able to obtain this rare species. 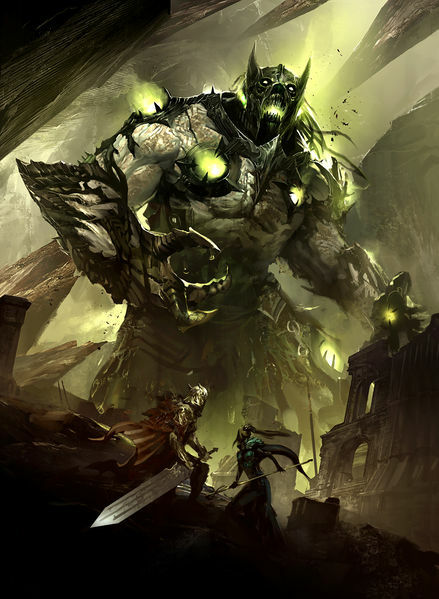 Are there some form of Giganticus Lupicus still roaming, or rather, hiding in the world of Tyria in the present day? Although highly unlikely, so little is known about this creature, and in fact the other continents on Tyria itself, that we cannot truly say for certain.